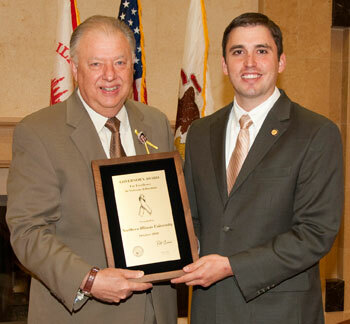 Northern Illinois University today was named recipient of the Governor’s Award for Excellence in Veterans Education, recognizing the university’s exemplary efforts in providing educational and informational resources to students who are U.S. military veterans. About 800 student veterans attend NIU, which earlier this year also was cited by two military-related magazines for excellence in its outreach and support efforts. “We must do everything we can to make sure that our service men and women, who have served our country proudly, have all the tools they need to further their education,” said Gov. Pat Quinn. “I applaud Northern Illinois University for their outstanding efforts to provide student veterans with access to on-campus resources and benefits that will help them make the transition back to school. “I strongly encourage other public schools in Illinois to keep working toward making their campuses as veteran-friendly as NIU,” Quinn said. NIU is only the second university statewide to receive the Governor’s Award for Excellence in Veterans Education, established last year after the governor signed into law the Higher Education Veterans Service Act. The Governor’s Award honors institutions that have best responded to the spirit and requirements of the new law by centralizing resources for veterans and easing their transition to college. The newly opened NIU Military Student Services office provides a shining example of how the university is working to make the campus veteran friendly. Located in Gilbert Hall, the office provides student veterans with a one-stop place to go with questions on available programs and services, such as academic support and individual student advocacy. The office also houses a Veterans Service Officer who assists students in accessing state and federal veterans’ programs. “I believe this award recognizes two very important dimensions of our university community,” NIU President John Peters said. “It is an acknowledgment of NIU’s commitment to the success of its veteran students, and it is a reflection on the outstanding students who have joined our institution after serving our country. Earlier this year, Military Times EDGE magazine ranked NIU 49th on its list of 101 top colleges for veterans, out of a total 4,000 institutions. G.I. Jobs magazine editors also named NIU for the second consecutive year as being among 1,120 top military friendly schools in the country, out of 8,000 colleges. In addition to establishing the new Military Student Services office, NIU has developed orientation programs designed for and led by veterans. The university offers a special course (UNIV 201) on the college experience for veterans, has enhanced its mental health services for veterans and works to educate faculty and staff about the unique needs of veterans and students who are still in the military. NIU has five full-time staff members plus graduate students and a team of veteran student workers dedicated to providing veteran services, including assistance with applying for educational benefits. “We connect as liaisons between the different institutions that provide benefits, so we can go to bat for other student veterans if they’re running into walls,” said student worker Dan Tsutsumi, a 25-year-old former Marine Corps sergeant who served two tours of Iraq. He’s now a junior studying broadcast journalism. “There’s always room for improvement, but we are trying our best to provide guidance, counseling and educational services that go above and beyond. 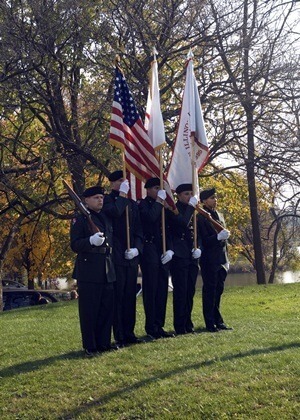 NIU boasts the longest standing student veterans club in the state, established in 1954. The club is active in sponsoring social events, networking opportunities and community service projects.